The Super Bowl is this weekend. While I’m not a football fan, who doesn’t love good game food? 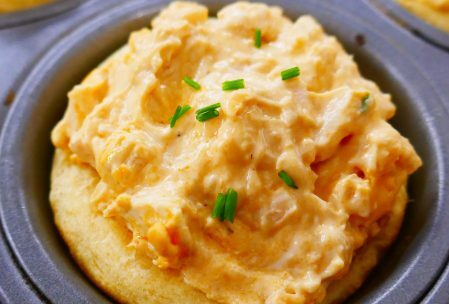 Buffalo chicken dip or Buffalo wings are a common game food. What if you can take the favorite flavor of buffalo sauce and make in a whole new way for the big game? I love Buffalo sauce and you guys know, if I can make something into a cupcake I will. 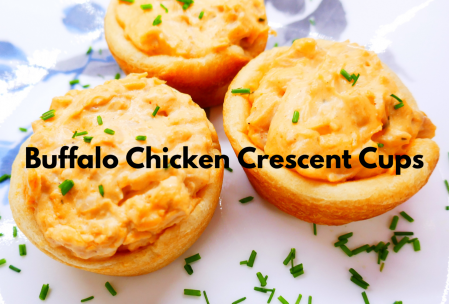 So here’s my take on the common buffalo chicken dip: buffalo chicken crescent cups. 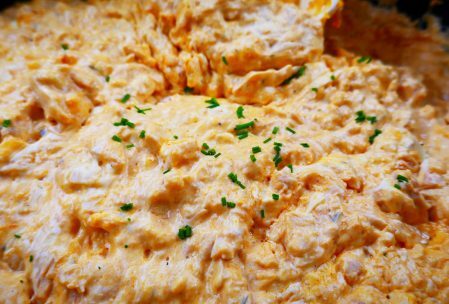 Let’s start by making my version of buffalo chicken dip for the buffalo chicken crescent cups. This recipe is designed for a crowd, so if you’re having a smaller viewing for your chosen game, cut ingredients in half. Mix the first 5 ingredients above together in a crockpot. Cook on low for 3 hours until melted together and creamy. If you need to make this recipe go even further on short notice, add another block of cream cheese and a couple tablespoons more of buffalo sauce. Once the hours are up, add green onions to taste, reserving some for garnishment. Preheat oven to 350 degrees. Prepare cupcake pans. This is where I use the olive oil in a small bowl. 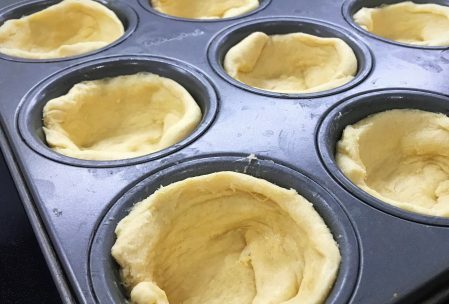 With a clean finger, dip in the oil and coat the inside of each cup of a standard size cupcake tray. If you’re using nonstick spray, prepare your pan with that. Unroll one triangle of crescent roll dough. Place with the short straight side to the left of a cupcake mold, it should resemble a pennant shape. Begin to press the crescent dough down and wrap the points of the triangle so they meet towards the base of the cupcake mold. Pinch together any meeting spots of the dough to ensure it seals once baked. Do this with each cupcake mold and triangle of crescent. Pillsbury crescent rolls come in a few sizes, I used tubes of 8 rolls each. 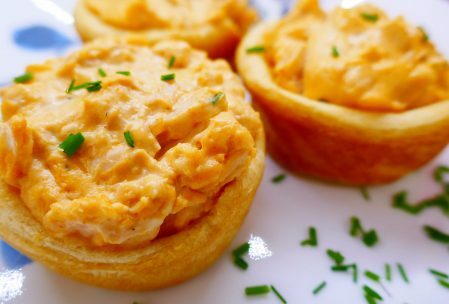 This recipe makes 24 buffalo chicken crescent cups, with some leftover filling. Now that the dip is made and the dough is molded, time to bake the crescent rolls. These must bake first before filling, that way the dough cooks appropriately. Cook per package instructions, I believe it was about 9 minutes. Check the sides, once they are golden brown they are ready. Best to be on the lighter side of golden brown even, because they will continue to sit in the pan and return to the oven briefly too. 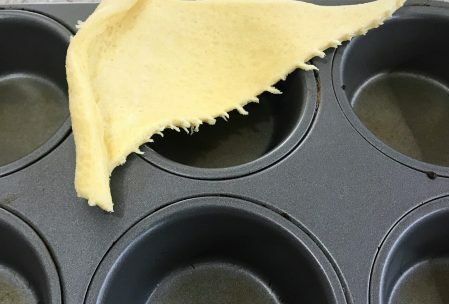 Once the crescents have baked, they will be quite puffy and full. Do not turn off the oven just yet! 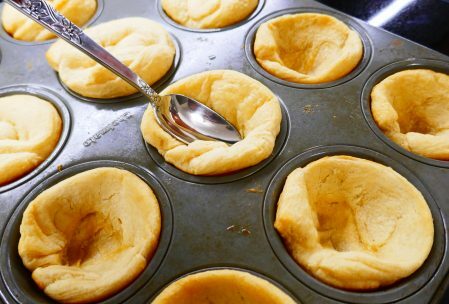 Sorry for that necessary interruption, back to the puffy crescent rolls… No need to worry about their puffy shape as far as filling goes. Use the back of a spoon and gentle even pressure to press down and shape to accommodate the filling. In the above photo, the crescents on the top left have not yet been shaped for filling so you can see the difference. The buffalo chicken dip is ready, the crescent cups are too, time to put them together and make into buffalo chicken crescent cups! 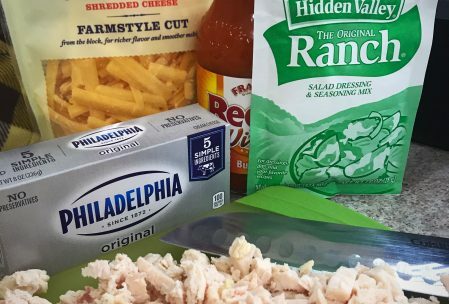 Using that same spoon, (one point for you for saving yourself a dirty dish), scoop your buffalo chicken dip into the crescent cups. Fill as desired. I like to over fill them since the dip to crescent ratio is greater, and I just can’t get enough of this delicious stuff and would rather get more in one cup than have multiple cups. Bake an additional 2 minutes. Once baked with the filling, garnish with chopped green onions or chives for color and freshness. Remove from pans to your favorite themed serving tray. Time to serve and enjoy your delicious buffalo chicken crescent cups! Enjoy the new take on a popular dip while you’re kicked back on the couch rooting for, well, whoever. You’re the real winner for making a winning game time snack. 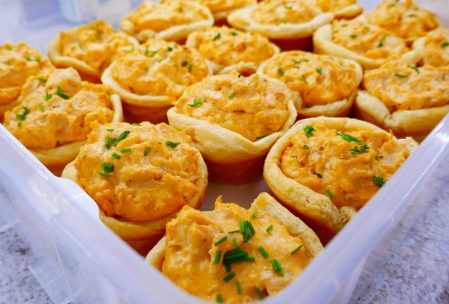 Buffalo chicken crescent cups take a delicious and classic dip to the next level. It is much easier to display for guests, take to a party, and eat on your lap while watching the game. My latest batch is on the way to an office football party. Will you make these for your next game day? What other game foods do you enjoy?